If you prefer teeth that are immediately whiter right now or you would rather whiten your teeth over a few nights while you sleep, Dr Feroz Gaffoor has your answer with Zoom! The Zoom! In-Office Whitening System uses proprietary technology to whiten your teeth an average of eight shades* in a little over an hour while you relax at your dentist’s office. It’s ideal for anyone who wants immediate results. The Zoom! Take-Home Whitening System uses a revolutionary patent-pending gel to whiten your teeth an average of six shades in three nights*. And you may go even lighter with additional applications. Start on Saturday and by Tuesday you’ll have a whole new smile. Just about anyone can benefit from tooth whitening. However, treatment may not be as effective for some as it is for others. With an oral exam, Dr Feroz Gaffoor can determine if you are a candidate for this procedure, including a shade assessment. By following some simple post whitening care instructions, your teeth will always be lighter than they were before. We recommend flossing, brushing twice daily with Whitening Toothpaste, and touch-ups with take-home Bleaching gel. These are professional formula products designed specifically to keep your teeth their brightest. They are available through our office. Yes! Consulting Dr Feroz Gaffoor is always the first step to whitening your teeth safely. Over-the-counter tooth whitening strips, brush-on gels and toothpastes take weeks or months to whiten your teeth just a few shades. Zoom! Is clinically proven to whiten your teeth eight shades* in one hour or six shades* in just one weekend. The Whitening Take-home gel is designed to be worn between four and eight hours per application. Dr Feroz Gaffoor will advise you on how long you should wear each application. A recent study showed that you can achieve an average improvement of six shades* after just three nights of use. Dr Feroz Gaffoor will help you determine how many applications are right for you. 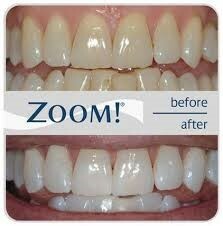 How is the Whitening Take-Home System different from the Zoom! In-Office System? The main difference between the two systems is that you use the Whitening Take-Home System in the convenience of your own home over a few nights. The Zoom! In-Office System is performed entirely in the office.